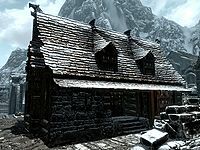 Brunwulf Free-Winter's House is the home of Brunwulf Free-Winter in Windhelm. It is a one story house, with a partial loft area located in Windhelm near the main entrance. Next door to Aretino Residence, almost directly opposite Calixto's House of Curiosities. It consists of only one zone, Brunwulf Free-Winter's House. * These people will only move here if Winterhold is under Imperial control. The entrance has a novice level lock. The entry leads straight into the main living area, with a practice dummy and a pile of firewood against the south wall. There are quite a few sacks of foodstuffs around the whole house. To the west of the entrance is a flight of wooden stairs up to a small loft area and behind the stairs is a small square wooden table with a bottle of Nord mead, two salmon steaks, a salt pile, a loaf of bread and a couple of wedges of cheese on top. Against the west wall is a small set of shelves holding a bottle of alto wine and a bottle of Nord mead. Against the north wall is a dresser containing fine clothes with two iron ingots and a potion of minor magicka on top. Further to the right still against the north wall is a long wooden table holding a mammoth snout, three tomatoes, three bulbs of garlic, a bunch of dried elves ear, a salt pile, a loaf of bread, a sweet roll and three slaughterfish eggs. Right of this is a fire pit with a cooking pot over it and a chair in front. By the chair is a copy of Immortal Blood. Beside the fire pit is a narrow wooden table holding a haunch of raw venison, a potato and a loaf of bread, with three wall shelves holding various skulls beside the table and hanging from the wall beside the shelves is a hunting bow. There is a doorway through into a bedroom to the east, with a bookcase to the left holding four common books. To the right of the doorway is a wall shelf holding a set of hide armor, bracers, shield and helmet, a potion of the berserker and an iron greatsword leaning against the wall beside it. Under the shelf is a long unlocked chest containing gold. To the right, in an alcove on the south wall is a large round wooden table holding an iron battleaxe and troll skull. The bedroom is very small consisting of a single owned bed opposite the doorway in the northeastern corner, with a respawning knapsack on the floor by the head of the bed, which contains leveled items. Against the east wall is a small unit holding a small coin purse and a leather strip. In the southeast corner is a corner shelf holding a potion of health, with a drum on the floor beside it. To the right, against the south wall is a small cupboard with an iron mace and eight loose septims on top. The loft area is very small and only contains a couple of barrels, one of which contains food. There is a Loot shadowmark to the bottom right of the entrance door. All containers; with the exception of most barrels, sacks, and the knapsack; are non-respawning and safe to store items in.